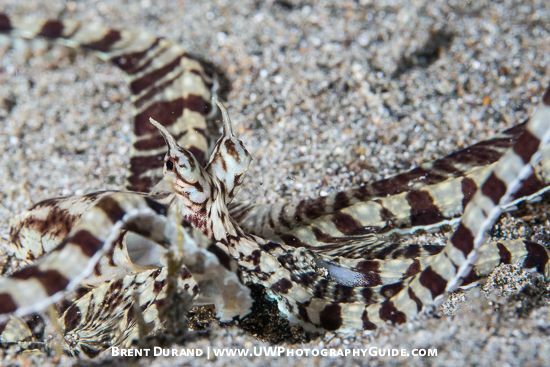 Detailed info on the Mimic Octopus (Thaumoctopus mimicus) including underwater photos, behaviors and the best dive sites for encounters. 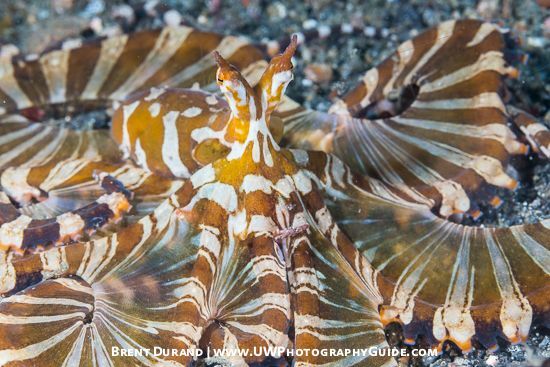 The Mimic Octopus (Thaumoctopus mimicus) is one of the most remarkable cephalopods in the ocean, delighting scuba divers and underwater photographers with every encounter. Like all octopuses, the mimic has chromatophores that produce color pigments in a range of patterns and colors, as well as the ability to change skin texture. The combination of these features allows octopuses to camouflage themselves on the reef, sand, rubble or open water and hide from would-be predators. 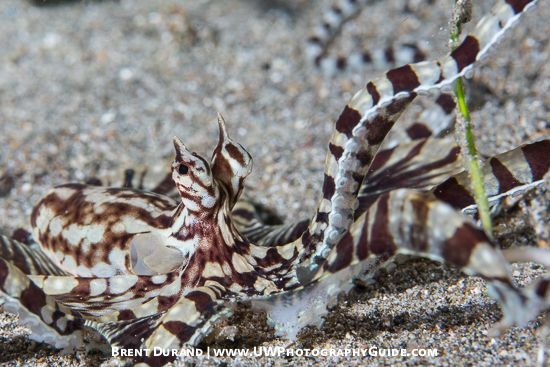 So what's different about the mimic octopus? 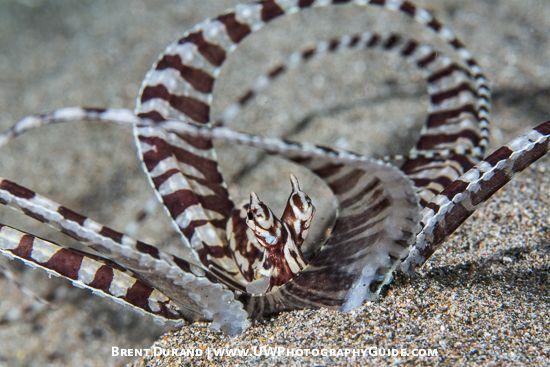 Like the name implies, the mimic octopus can mimic serveral different fish and critters with startling accuracy. It happens very quickly, with creativity that would make a superhero jealous. Mimics are most often seen by divers on sandy substrate and when they want to cover ground quickly will form a shape that looks like an oval spaceship floating over the sand. Or does that look like a flatfish? They generally live and seek protection in holes in the sand, often leaving two banded tentacles of of the hole - one in a defensive posture and one extended and waving slightly. Or does that look like a banded sea snake? It's remarkable to think that the Mimic Octopus has evolved to mimic certain creatures in its environment when it will be advantageous. A flatfish is not very interesting moving quickly across the sand. 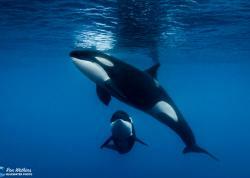 And most predators have no desire to approach a poisonous sea snake. 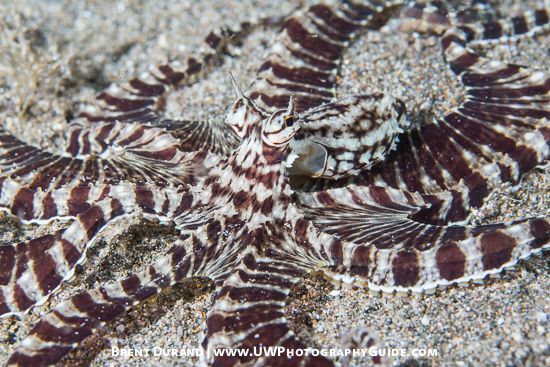 The Mimic Octopus also has a few other impersonations that are less frequently seen, including forms that look like jellyfish and lionfish. 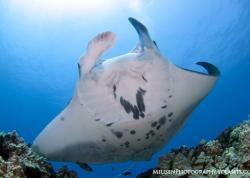 Naturally brown in color, they prefer open sand / silt bottom in relatively shallow water. Often dive guides will look for mimic octopuses right at the start of the dive or at the end during a surface interval. Muck dive sites make an ideal habitat. 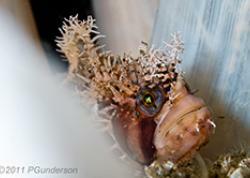 Mimics are most active early morning and in the evening, finding their way across the substrate while feeling inside holes and under rocks for small crustaceans and fish. Once located, the mimic will trap the prey in the suckers on any of their 8 tentacles, then moving the prey to their mouth. Your macro lens will provide too much magnification while a wide-angle lens will render the mimic octopus very small in the frame. Mirrorless: The 60mm lens is a great choice. DSLR: On crop sensors, a 60mm lens is a great choice. On full frame, I shoot at either 100mm or 40mm. No photo is worth injuring yourself, the reef or any critters there, so make sure to look where you're going. I often find myself frog kicking sideways or backwards when shooting mimics so it's critical to make sure you know what's "in front of you". Why is this a photo tip? Because once harassed, the Octopus behaves differently than if you stalk it naturally hunting, swimming or remaining frozen. 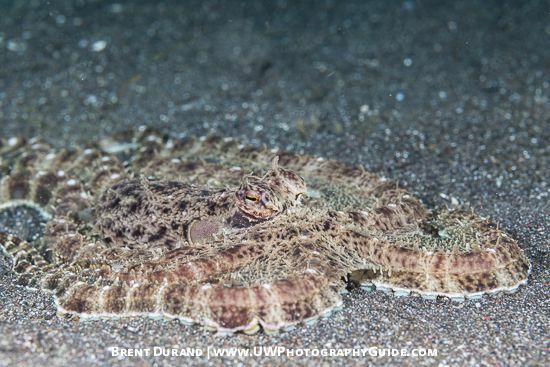 You might get some likes on your post with a photo of a defensive subject, but that photo would never win a contest with experts who know the octopus behaviors. It pays to be patient and wait for the right moment to push the shutter. The Wonderpus Octopus (Wunderpus photogenicus). While the Wonderpus has fixed bands on its legs, the Mimic may or may not have the bands, so that's a tough way to distinguish between the species when underwater. The best way to differentiate the mimic form the wonderpus is the white line that runs along the bottom of each tentacle of the mimic. The wonderpus doesn't have this line and the mimic will always have it, allowing for clear identification.